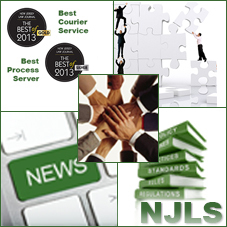 NJLS is an 87-year-old award-winning courier and service of process provider for the New Jersey legal community and offers cost-effective pickup and delivery services to a broad range of businesses and government entities. Our clients are legal and business professionals at small to large law firms, banks, pharmaceutical and medical device companies, realty firms, municipalities and logistics companies that need experienced and cost-effective pickup and delivery services and/or litigation support. Clients receive expert local service at significant savings. Mission: When delivering documents or packages for businesses or serving papers for law firms, our mission is to quickly and cost-effectively get their jobs done, inspiring confidence in our expertise. Vision: To be the preeminent provider of courier services to an array of New Jersey law firms, businesses and government agencies as well as service of process to law firms ranging from solo practitioners to the Am Law 200. NJLS has roots dating back to 1929 as the New Jersey Lawyers Service, which was established by Aaron Skinder and Frieda Pickman. They graduated law school in New York City in 1929. Instead of practicing law, they decided to create a firm that would provide products and services to the legal community. Thus, they began a courier service in Newark, N.J., running papers between firms and courts. Today, NJLS delivers more than 3 million documents and packages each year. NJLS’ clients include approximately 25,000 lawyers and over 1,000 businesses as well as the New Jersey Administrative Office of the Courts, Office of Administrative Law and Department of Labor. Our diverse clients include legal and business professionals at small to large law firms, banks, pharmaceutical and medical device companies, realty firms, municipalities and logistics companies. The diverse and highly experienced NJLS Management team includes the founders and senior leaders of those acquired companies. The Affiliates of NJLS include sister companies that are well-known within the legal community. NJLS also has several key Partners. NJLS strictly adheres to a variety of Compliance regulations and is a member of several industry associations. The Holiday Schedule details the New Jersey courts, State and Federal that are closed for the specific legal holidays. For the latest happenings, NJLS’ News, Events and Awards have the highlights.